Betty Fiorina, who served three terms as secretary of state in New Mexico, died this week at her Santa Fe home after a long struggle with Alzheimer's disease. She was 90. Born in El Paso to Delphine Sauders and Jules Vicknair Sr., she married Anthony Fiorina, who preceded her in death. She began working for the state Legislature, where she was deputy chief clerk for the House of Representatives by 1951. That’s when Fabian Chavez, who began serving his first term in the House that year, met her. Betty Fiorina won her first election as Secretary of State in 1958. During that period the terms were only two years. She won a four-year term to that office in 1970. Before that last term, Betty Fiorina served as chief clerk of a Constitutional Convention in the late 1960s. The chairman of that convention was the late Bruce King, who go on to win three terms as governor. She was active in her son’s campaigns for municipal judge in the 1980s and ‘90s. The New Mexico State Printing Facility off Siringo Road in Santa Fe is named for Betty Fiorina. Besides her love for politics, Betty Fiorina also had a great love for dogs, Tom Fiorina said. “I know she’s going to Heaven, but she’s also going to Dog Heaven,” the former judge said. She is survived by: her sons Tom Fiorina and Gary Fiorina, four grandchildren and two great grandchildren. A service for Betty Fiorina is scheduled for 10 a.m. Wednesday at Calvary Chapel, 2520 Camino Entrada. Burial will follow at the Santa Fe National Cemetery at 11:30 a.m and a reception at 12:30 p.m. at a location to be announced. In lieu of sending flowers; the family suggests that donations be made to the Alzheimer’s Association at PO Box 96011, Washington, DC 20090-6011. Kevin Wilson of the Clovis News Journal has the whole story HERE. It looks like all five candidates were there. It's not clear whether Texans in attendance were allowed to vote. 139 people there cast ballots. A lawyer who has worked for the state Attorney General’s Office for 10 years will be the next state district judge in Santa Fe. Gov. Bill Richardson on Thursday appointed Deputy Attorney General David K. Thomson to fill the vacancy of retiring Judge Daniel Sanchez. “Dave Thomson has been serving the people of New Mexico through his work at the Attorney General’s Office for more than ten years and I am certain that his experience will be valuable to the Court,” Richardson said in his announcement e-mail. More in Friday's New Mexican. House and Senate Leaders "In a Good Mood"
House and Senate leaders have been negotiating over the state budget today. Along with some TV reporters, I caught some of them leaving their closed-door meeting for a late lunch. They all seemed in jolly spirits. Sen. John Arthur Smith, chairman of the Senate Finance Committee joked, "All the blood's in the other room." But apparently no deal has been reached. Said Smith, "We're getting along great. We agreed to a duel later on. But right now, everybody's getting along fine." Rep. Lucky Varela, who chairs the Legislative Finance Committee, said, "We're all in a good mood. We're going to make it. Give us time, OK. Give us time." Asked whether he expected a special session on Monday, he said, "If the governor calls us. He hasn't called us yet." House Speaker Ben Lujan said no deal has been reached yet. But they'd meet again after lunch. I know I've posted a lot this week, but here's the Public Policy Polling survey of the New Mexico Congressional races. Her in District 3, incumbent Democrat Rep. Ben Lujan is leading both his GOP rivals, but he's got low approval numbers -- 31 percent positive and 40 percent negative. In the other races, Incumbent Martin Heinrich of Albuquerque has a decent lead over Republican newcomer Jon Barela. But down south former Rep. Steve Pearce, the Republican challenger has a two point lead over incumbent Harry Teague. That's pretty much on track with the internal poll the Pearce campaign released this week. PPP surveyed 400 voters in each Congressional district from February 18th to 20th. The margin of error on each survey is 4.9 percent. PPP is a Democratic firm and uses an automated polling system. UPDATE: Tom Jensen of PPP alerted me that there was a typo on the original version. I've deleted that and uploaded the corrected version here. In arguing against the recent poll on New Mexico gubernatorial politics by the North Carolina-based Public Policy Polling yesterday, the state Republican Party mentioned an internal poll that showed a generic Republican edging out a generic Democrat in the November gubernatorial race. The PPP poll showed Democrat Diane Denish beating all Republican candidates. The closest GOP contender was Pete Domenici, Jr. who was within 5 points of Denish. I asked GOP spokeswoman Janel Causey for a copy of their poll, and she sent it to me. As she said in the news release yesterday, "The Republican candidate" received 44 percent of the vote while "The Democratic candidate" got 40 percent. This poll was conducted Jan. 25-27. 500 likely New Mexico voters were interviewed by phone. The margin of error is 4.3 percent. Bill Richardson is down. Diane Denish is up, but Pete Domenici Jr. would fare better against her than any of his fellow Republicans. Those are the conclusions of a poll on New Mexico gubernatorial politics by the North Carolina-based Public Policy Polling released Wednesday. State Republicans tried to throw cold water on the poll results — referring in a news release to "liberal data" from a "Democratic firm" (PPP indeed works exclusively for Democratic candidates and organizations. I'm not sure whether this makes their data "liberal.") Meanwhile, a spokesman for the Democratic governor said PPP "relies on unscientific polling methods with untrustworthy results." But New Mexico pollster Brian Sanderoff said Wednesday that while he can't vouch for PPP's exact numbers, the "general trends" and "big picture statements" in the poll ring true. The poll is based on surveys of 990 New Mexico voters from Feb. 18 to 20. The survey's margin of error is 3.1 percent. The "interviews" are automated. A recorded voice reads the questions while the participant answers by pressing numbers on the phone. Sanderoff has said that automated polls tend to undercount undecided voters — because those not interested tend to hang up on robots. Also, he said out-of-state pollsters often have more Hispanics represented than the percentage who actually vote. 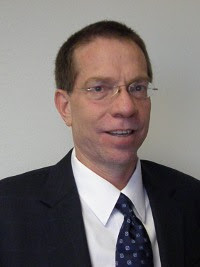 PPP director Tom Jensen defended his company, saying in an e-mail to state reporters and bloggers, "In 2008 PPP was the most accurate pollster in New Mexico, showing Barack Obama winning the state by 17 (percentage) points. No other pollster's final survey showed Obama winning by more than 10, and he ended up winning the state by 15." Richardson numbers: According to PPP's blog, Richardson — who won re-election with nearly 70 percent of the vote — has become "one of the least popular governors in the country." The poll says his disapproval number is 63 percent; only 28 percent approve. Even among Democrats, only 42 percent approve while 47 percent disapprove. Sanderoff said PPP's approval number seems low. He did a poll for the Albuquerque Journal in September that showed Richardson's approval at about 50 percent. A SurveyUSA/KOB TV poll from the same month showed that number at 47 percent. But he doesn't doubt Richardson's numbers have sunk since September, mainly because of the "continued negative publicity regarding state investments and allegations of pay-to-play." Richardson spokesman Gilbert Gallegos said in an e-mail he'd never heard of PPP. He noted that Richardson has had to make unpopular decisions "cutting spending and ordering employee furloughs in order to balance the budget." Governor's race: The PPP poll shows Denish, the lieutenant governor, beating Domenici Jr. by a 5-point margin and leading the other four candidates by margins between 14 and 18 percentage points. Unlike Richardson and the Republicans, the Denish campaign in an e-mail didn't question the results, noting Denish was ahead "even in this hostile political climate." The campaign of another GOP contender, Susana Martinez, concurred regarding Domenici's name recognition but attacked other aspects of the poll. "It is highly suspect that all the Republican candidates have net negative image ratings at this point in the campaign. While it is expected that the Republican candidates would have low name ID and soft image ratings, it is not believable that they have achieved this net negative rating without a campaign having been meaningfully launched against them." Sanderoff agreed, saying it's hard to believe that little-known candidates could have unfavorable numbers in the 20 percent range. One thing everyone agrees on: It's still early. Lt. Gov. Diane Denish is leading Republican rivals in the governor's race, accoeriding to the just-released poll by Public Policy Polling. This is the same poll that shows Gov. Bill Richardson's numbers way way down. The poll is based on surveys of 990 New Mexico voters from February 18th to 20th. The survey’s margin of error is 3.1 percent. PPP is a Democrat polling firm. The consensus reaction is "DELAY IT MORE!" My story in the paper about Gov. Bill Richardson's decision to delay the special until Monday is HERE. Basically everyone I talked to thinks the special should wait until after the revenue projections come in, which is in April. Santa Fe Sen. Peter Wirth told me he was happy that the governor recognized that it would be a waste to have a special session without a budget agreement in hand. "It's critical we have a road map," Wirth said. But Wirth said unless there looks like there's a budget agreement between the House and Senate, it could be a waste to attempt to hold a special session next week too. "There's no reason to bring us in if there's gridlock," Wirth said. "The constituents I represent think it's wasteful if we're sitting there spending taxpayer dollars on a special session if there's no plan." There's one lawmaker I talked with who I felt bad for. House Republican Leader Tom Taylor told me he found out about the change in plans only after "I drove over here from Farmington last night in a blizzard." Bad news for the governor. According to Public Policy Polling's blog, a recent poll show that Bill Richardson, once one of the most popular politicians New Mexico has ever known, has become "one of the least popular governors in the country." PPP is a Democrat firm based in North Carolina. According to the poll, Richardson's disapproval number is 63 percent. Only 28 percent approve. Even among Democrats, only 42 percent approve while 47 percent disapprove. There's no explanation why the numbers are so terrible. I assume it's got something to do with the scandals, the economy and perhaps the general anti-incumbent mood of the coutry, (which is fueled by the economy.) Who knows, maybe even the way he was knocked around in the Legislature had something to do with it. "How much is all of that affecting Democratic prospects for keeping the Governor's office?" the blog asks. "We'll tell you tomorrow." The full poll hasn't been released yet, so I don't have sample size, margin of error, or even when the poll was taken. The previous job approval poll poll I've seen of Richardson was last September by Survey USA. That poll showed his numbers about even -- 48 percent approving, 47 percent disapproving. Gov. Bill Richardson today announced he has agreed to push back the date of the Special Session to deal with the state’s budget to Monday, March 1st at the request of legislative leaders. Sometimes national attention isn't a good thing. Just ask GOP gubernatorial candidate, who was mentioned over the weekend in an online chat on the Washington Post Web site with political blogger Chris Cillizza. 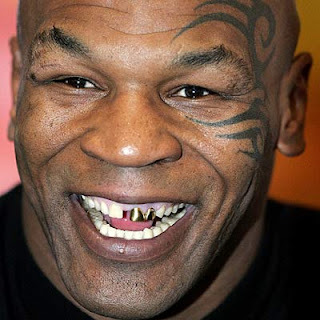 A participant suggested that there should be an equivalent of "The Tyson Zone" for politicians. This is the concept of sports writer Bill Simmons, who explains that he came up with it, "after reaching a point at which I would have believed any story about Mike Tyson (real or made up). Over the past few years, a few other celebrities (Ron Artest, Britney Spears, Michael Jackson, Dennis Rodman, O.J. 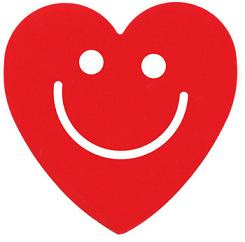 Simpson, Courtney Love, R. Kelly, Lindsay Lohan, Roger Clemens) have received a Tyson Zone stamp from me." I love the Tyson Zone. My member this week: Pete Domenici Jr., the son of the New Mexico Republican Senator, who is running for governor. After delivering one of the worst announcement speeches ever, Domenici Jr. admitted that he had done marijuana and cocaine in the past. Um, not good. That could be a little harsh. As several New Mexico political hounds, including this one, have noted, similar cocaine revelations didn't hurt the election efforts of Barack Obama or Gary Johnson. But it's going to get harsher. As pollster Brian Sanderoff told me yesterday, Domenici's radio appearance last week on Jim Villanucci's show on KKOB-AM will come back to haunt him in the coming weeks. "I suspect we'll be hearing sound bites from that interview," Sanderoff said. Actually Pete Domenici Jr. is in second place behind perennial candidate I. Dunno. The poll is the first scientific one I've seen for the governor's primary. It was conducted Feb. 9-13 by political science students at NMSU. 444 registered Republicans who voted in at least one of the last two GOP primaries. They were asked which candidate they supported for governor. Name recognition apparently is a big factor here. More than 36 percent named Domenici as a candidate without prompting. (His dad, Pete Sr. was a U.S. senator from New Mexico for 36 years.) More than 21 percent named former state GOP Chairman Weh. Martinez was named by 18-plus percent, while more than 16 percent named Turner. A little less than 8 percent named Arnold-Jones without prompting. In today's Las Cruces Sun, spokesmen for two of the candidates disputed the poll. Weh's spokesman said the poll was biased, claiming Jose Garcia, the NMSU professor in charge of the class that conducted the poll, is a Martinez supporter. Garcia denied it, pointing out that he's a Democrat. Arnold-Jones' spokesman apparently consulted the Golden Treasury of Campaign Clichés, when he responded, "The only poll that matters is the one taken by the voters on Election Day, and I am confident the voters will respond to Representative Arnold-Jones' message." How that big number of undecideds reacts to that interview could be a major consideration in this race. The full poll with all the questions is below. So what did taxpayers get for the $4.87 million 30-day budget session of the state Legislature? Well, one thing we didn't get was a budget for state government. Because the state Senate and House couldn't agree on a budget plan, Gov. Bill Richardson said he'll call a special session to convene next Wednesday. Both the governor and House leaders said the House and Senate were getting close to a budget compromise — but they just ran out of time. But there was lots of time for other legislative activity. To be sure, lots of bills passed. There's the whistle-blower protection act to stop possible retaliation against those who report official wrongdoing. In the final hours, the Legislature passed a bill to reform the scandal-ridden State Investment Council. There's a bill that would replenish the state general fund by some $150 million that had been set aside for capital-outlay projects that never got off the ground. A bill prohibiting "double dipping" by public employees who retire and then return to work with a government salary while receiving retirement benefits also passed. And, if the governor signs the bill, you'll be able to take a concealed weapon into a restaurant that serves beer and wine. But there were many hours spent on activities that the average person, and maybe even a few average legislators, might consider less than productive. First there's the whole area of memorials, nonbinding pieces of legislation in which lawmakers express the general will of the House or Senate — or in the case of a joint memorial, both. Memorials can express an opinion on a national issue or honor a star athlete from a legislator's local school district, or recognize historical figures such as Navajo Code Talkers. Some memorials pay tribute to political figures who died in the previous year. Among those so honored this year were former Gov. Bruce King; Maralyn Budke, former chief of staff to former Gov. Garrey Carruthers; and Patty Jennings, wife of Senate President Pro-tem Tim Jennings. Others declare special days for various people, New Mexico communities, organizations, etc. This year, the Legislature took the time to declare "League of Women Voters Day," "Farm & Ranch Day," "World Cup Day," "Las Cruces Day," "100th Anniversary of the Boy Scouts Day," "Native Plant Day," "Medical Marijuana Day" and "Posttraumatic Stress Disorder Awareness Day" among others. Often memorials request state agencies study various issues, looking at possible future legislation. Among the study memorials that passed were House Memorial 75, sponsored by Rep. Brian Egolf, D-Santa Fe, which asks the Department of Cultural Affairs to study the feasibility of designating the Santa Fe Children's Museum as a state museum; House Joint Memorial 30, which asks the same department to study the feasibility of designating the historic Tucumcari Railroad Depot as the State Railroad Museum; HJM 7, which requests the Children, Youth & Families Department to assist private groups in a study of child homelessness in the state; and Senate Joint Memorial 56, which requests the Department of Game and Fish to study consolidating various licenses and stamps "to reduce the complexity and facilitate the purchase of the proper licenses for hunters and fishermen." But all memorials take time. Some just a few moments for a quick explanation and a vote, other more controversial matters can take an hour or more. The House passed 66 memorials and 47 joint memorials, 22 of which were passed by the Senate. The Senate passed 36 memorials and 34 joint memorials, 14 of which also passed the House. Then there's the matter of "mirror" bills — identical or similar pieces of legislation introduced in both the House and the Senate. Neither bill goes to the governor for signature unless it passes both chambers. This year, the most time-consuming mirror bill was the Hispanic Education Act. Each went through the committee process in both chambers and each eventually was passed by both chambers, so both will go to Richardson to sign. It was a controversial measure — Republicans opposed it strongly. So the act was debated at length, not once but twice, in both the House and the Senate — as the clock ticked on the budget. Richardson told reporters Thursday he hopes the special session will be more focused and said he will not put many bills other than the budget on his call. UPDATE: Steve Aikens, the Clovis firearms instructor who has worked at least a couple of years on the "guns and restaurants" pointed out that not just anyone could take a gun into just any restaurant that serves beer and wine under the bill that passed the Legislature. You'd have to have a concealed-carry license and the restaurant would have to have a beer-and-wine license (as opposed to a full liquor license). Thanks, Steve. 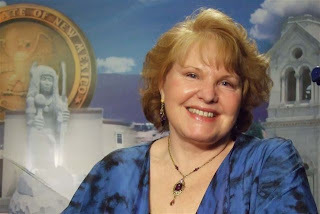 New Mexico, on Channel 5, KNME-TV, the PBS station in Albuquerque. Folks in the Eastern part of the state can see the show Saturday night at 6:00 p.m. on Channel 3,KENW-TV, the PBS station in Portales. Then on Sunday morning, at 7:30 a.m. KNME-TV will rebroadcast the show. Then at 8:30 a.m. KRWG-TV, the PBS station in Las Cruces will air the show. You won't get to see our pretty faces, but the show will be on the radio 9:30 a.m. Monday, on KANW-FM, 89.1 FM in Albuquerque. Now that the Legislature's over -- for this week --I should catch up on what's going on in the race for governor. The biggest news there, of course, is Pete Domenici, Jr.'s interview on KKOB with Jim Villanucci, in which he admitted to using cocaine and marijuana while growing up in the 70s and 80s. At least two other politicians have made similar confessions years ago -- Former Gov. Gary Johnson and President Barack Obama. The first rival gubernatorial candidate to point this out was Allen Weh. In a news release Thursday, Weh mentions the drug admission. But the focus of his attack was on another question Domenici answered. The transcript as included in Weh's e-mail. Jim Villanucci: Are you the best person to win the general? Pete Domenici Jr.: The general is going to be an extremely difficult election. The perception out there that somehow any of the five candidates can and should win the general, I disagree with strongly. Jim Villanucci: Who can't win? Pete Domenici Jr.: I don't know if I want to say particular names of who can't win. Jim Villanucci: You obviously have a feeling on that. You said that not all of you can win, so somebody can't, and you think you can. So, who can't? Pete Domenici Jr.: Actually, I would even include myself in the group that can't. For those who wish to know the truth, my statement on KKOB was ripped out of context in an intellectually dishonest manner by Allen Weh. His excerpt from the KKOB interview ended with my statement about how hard it will be for Republicans to win without the best candidate. The rest of my statement concluded with, I'm saying I can win, and I'm concerned with the perception that I'm hearing (from Allen Weh) that says any of them (the Republicans running) can beat Denish. I don't agree with that. Mr. Weh cannot win. He has alienated too many Republicans and voters across the board. For him to have ripped out of context an innocent sentence was a half-truth and reflects the same type of dishonesty we are trying to rid our State Government of. Meanwhile, on the day of the KKOB interview, Domenici's campaign launched an attack of their own on another Republican candidate Susana Martinez. He criticized her for accepting her salary as district attorney in Las Cruces while running for governor. By the way, Weh isn't the only candidate calling attention to Domenici's statements. Democratic gubernatorial candidate Diane Denish's campaign also is emailing recent news and blog stories. Gov. Bill Richardson's office last week complained about too much "bovine manure" at the Roundhouse. Was that just a clever way to make sure that this bill got passed? The session is over. The Senate went down debating the treatment-not-incarceration bill (HB178). Yes, we have no budget. So, Gov. Bill Richardson says he'll call a special session on Wednesday. It'll be all budget, he said. No domestic partnership ("We don't have the votes," the governor said). But he might put an ethics commission bill on the call. As far as the budget goes, House Speaker Ben Lujan said they were at the one yard line but just couldn't complete the pass for the touchdown. House Republicans just tried to blast the veto override of Senate Bill 531 out of the House Judiciary Committee. They failed. House Majority Leader Ken Martinez made a motion to table Rep. Paul Bandy's motion to blast the bill. The tabling motion won 37-29. That means the override effectively has been overridden. The Judiciary Committee tabled the override Wednesday afternoon on a party-line vote. My story on that is HERE. The bill, sponsored by Democratic Sen. Tim Keller, would have forced state agencies to provide the Legislative Finance Committee with confidential information about contracts and programs. The measure last year had unanimously passed both chambers of the Legislature before Richardson vetoed it. 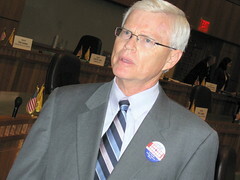 The bill stemmed from last year's refusal by Pam Hyde, then secretary of the Human Services Department, to comply with a Legislative Finance Committee request for information about Medicaid, including costs by managed-care companies that administer health care services in New Mexico through state contracts. Katie Falls, the newly confirmed secretary of the Human Services Department, told the House committee that the decision to withhold the information was her predecessor Pam Hyde's. Falls said she had no problem providing the requested information and already had talked to LFC director David Abbey about it. Within a few minutes the House passed a couple of bills aimed at making government more open and less corrupt. Most recent one first: They passed the Whistleblower Act, SB96 by a 61-1 margin. This would protect people who report official wrongdoing from retaliation. This bill will be sent to the governor for his signature. Though Richardson vetoed a different whistleblower bill in 2007, this year, he put it on his call and asked for such a n act in his State of the State address. This vote came after House approval, by a 65-1 vote of the Sunshine Portal Transparency Act, SB 195. This bill would create a Web site that would include a monthly list of the revenue received by the state -- broken down by source, such as taxes, fees or fines. The portal would include tools for tracking the status of capital-outlay projects and public meetings. The House amended the bill to not include the names of classified state employees and their salaries. However the names and salaries of exempt employees would be part of the portal. Because it was amended the bill has to go back to the Senate for concurrence before going to the governor. A legislative session is full of funny little moments that provide a couple of chuckles during long and often tedious days. One of those took place this week on the Senate floor. Senate Democrat Leader Michael Sanchez, took the microphone Tuesday afternoon to call attention to Sen. Eric Griego who was talking with Senate President Pro-tem Tim Jennings at Jennings’ chair. Sanchez joked that the two men were hugging. Taking the cue, the two men proceeded to actually hug. Everyone laughed. Yes, this is what passes for humor in the stale Legislature. But what was truly funny was that this happened shortly after a piece by Griego titled “An Open Letter to Fellow Democrats” started popping up on the blogs (I first stumbled upon it on Democracy for New Mexico.) . And one of the major topics of the piece was one Roswell Democrat named Tim Jennings. There were no hugs in this letter. “While Sen. Jennings is a nice enough guy, his political philosophy is in stark contrast to the majority of rank and file Democrats — not to mention the state party platform,” Griego wrote. A Valentine from Eric: Griego obviously isn't vying for the title of "Mr. Congeniality" in the Senate. In fact, the "open letter" wasn’t the first shot he took at the Senate Democratic leadership this week. Over the weekend, Griego was irate about Majority Leader Sanchez’s handling of a bill pertaining to Webcasting. So on Sunday night, he emailed a press release to reporters saying, “Sadly, the biggest obstacle to transparency in the New Mexico Senate has been the Democratic leadership." The split between the Democratic Party’s progressive and conservative wings have been intensifying lately. This drift to the right by Senate Democrats is going to hurt the party in November, Griego predicted in his open letter. There were lots of glazed eyes and blank expressions in the Roundhouse on Wednesday, the last full day of the Legislature. A couple of those eyes belonged to a large mounted head of an oryx. The Legislative Sportsman's Caucus and Foundation presented the trophy New Mexico School for the Blind and Visually Impaired in Alamogordo, where it will become part of a “Sensory Safari,” a collection and game mounts at the school where children and adults are able to enjoy the state's native wildlife through the sensation of touch. The oryx had been missing from the collection. A reader just pointed out that Gov. Bill Richardson's recent blog post that joking declared an emergency about "bovine manure" has disappeared. Even the subsequent post that explained the declaration was only a joke is missing too. In fact now the most recent post is dated Feb. 10. I guess that means the emergency is over. If I were king of the Legislature, I'd decree that everything stop at noon the day before the end of the session and play this song in every room of the Roundhouse -- at least in the House and Senate chambers. By the way, the rumor that this video was shot in the House Lounge simply isn't true. Bills that would establish a state ethics commission are being opposed — at least in their current form — by several organizations. some of which for years have advocated an ethics commission. Senate Bill 43 is awaiting action by the full Senate. That’s also the case in the House for the similar House Bill 43. Sen. Linda Lopez, D-Albuquerque, who is sponsor of the Senate bill, told me Saturday that such confidentiality requirements are necessary to protect the reputation of officials and candidates. On Saturday, speaking to the Senate Judiciary Committee, Jim Noel, representing Gov. 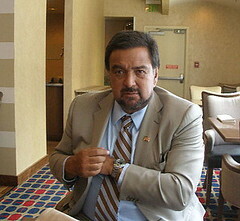 Bill Richardson's office, questioned whether the confidentiality provisions in the bill were constitutional. Besides NMFOG other groups opposing the bills include, Common Cause New Mexico, the Greater Albuquerque Chamber of Commerce, American Association of Retired Persons and the League of Women Voters of New Mexico. The Senate just passed House Bill 25, which would would allow New Mexicans to renew their driver’s licenses online or over the phone. It's a mirror bill of Senate Bill 137, which was the subject of my Roundhouse Roundup column last week because it somehow grew into a free-wheeling discussion of issues including illegal immigration, terrorism, drug abuse, Guatemalan gangs and Islam and a tense detour into racism. The consideration of the House bill (sponsored by Rep. Nate Cote) barely lasted a minute before the Senate voted 31-2 to pass it. The Senate bill, sponsored by Sen. Phil Griego, is still in the House Judiciary Committee. HB25 goes to the governor. The Senate unanimously approved Senate President Pro-tem Tim Jennings' SB269, which would create an independent counsel to seek to recover investments lost by the State Investment Council, Educational Retirement Board and the PERA. Jennings stressed that the special council would not be responsible for investigating possible criminal wrongdoing. But if evidence of a crime was uncovered, it would be turned over to the state attorney general, Jennings said. The bill includes a $400,000 appropriation, which would be paid for out of the retirement funds. "It makes more sense that to just say adios to these dollars," Jennings said. Sen. Dianna Duran asked Jennings whose responsibility this would be without the special council. Jennings said it would be the attorney general's office and the investment boards themselves. But there hasn't been much action by those agencies, he said. Sen. Tim Keller said that in committees representatives of the attorney general testified they didn't have the money to pursue such investigations. By a vote of 17-25, the Senate just rejected the nomination of Neri Holguin to the Environmental Improvement Board. 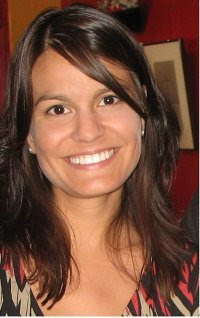 Holguin is a professional Democratic political consultant who ran the campaigns of Sens. Eric Griego and Tim Keller among others. That didn't stop 10 Democrats from joining with Republicans to kill the nomination. In fact, her work on those campaigns apparently is what sunk her. Although Holguin doesn't work for the Center for Civic Policy or its affiliate, New Mexico Youth Organized, and the Southwest Organizing Project, the vote was the latest manifestation of many senators' animosity towards those groups. The CCP and NMYO were the non-profit groups that during the 2008 primary season sent out flyers criticizing the voting records of several legislators including former Sens. Shannon Robinson and James Taylor -- who lost to Keller and Griego respectively. Critics of the non-profits blasted the groups for not disclosing their financial contributors. Griego expressed anger at the vote, noting that lobbyists and others representing corporate interests routinely are confirmed for boards and positions. He also noted that the Senate approved the confirmations of University of New Mexico regents despite concerns about the politicalization of the Board of Regents. Griego said there's noting wrong with making a living as a political consultant. Keller said it was unfair to single out "a 35-year-old woman" for some senators' problems with the non-profits. Senate President pro-Tem Tim Jennings said he voted for Holguin, but he shares the opponents' concerns about non-profits. He claimed some non-profits that get involved in elections are government funded. UPDATE: The Democrats voting against Holguin were senators Linda Lopez of Albuquerque, Richard Martinez of Espanola, Howie Morales of Silver City, George Munoz of Gallup, Mary Kay Papen of Las Cruces, John Pinto of Tohatchi , Bernadette Sanchez of Albuquerque, John Sapien of Corrales, John Arthur Smith of Deming, and David Ulibarri of Grants. I was surprised and disappointed by today's confirmation vote. Since July, I’ve served on the Environmental Improvement Board in a thoughtful and principled manner. I have a long track record of working on conservation in New Mexico. I will continue to advocate for the responsible stewardship of our natural resources and the public health, safety and welfare of New Mexicans. As its done in previous years, a major tobacco company is running a phone bank to urge New Mexicans to tell legislators to vote against raising cigarette taxes. A spokesman for Altria, parent company of Phillip Morris, said Monday that such calls are supposed to go only to smokers over the age of 21 who have requested such information. However, one person who received a call from the company did not fit that description. She is the teenage daughter of an American Cancer Society official. Cynthia Serna, the regional grassroots development director of the American Cancer Society Cancer Action Network, said her 15-year-old daughter received the automated “robo call” from Phillip Morris on Monday morning on her cell phone. According to her daughter, Serna said, the caller gave a brief introduction about “a bill introduced by the New Mexico Legislature to increase the cigarette tax.” The girl’s cell phone was “cutting out,” Serna said, so she didn’t recall more specifics. But she said that the called asked her if she supported or opposed the proposed tax increase. “When she said she supported it, the caller thanked her and hung up,” Serna said. Cell phones of minors frequently are listed under their parents’ names. Altria hasn’t yet disclosed its expense report for the phone campaign. The report is not due until after the session. Last year the company spent a reported $15,113 on phone banks to generate opposition to cigarette tax hikes. The Senate on Saturday approved a measure that would increase the tax on cigarettes by $1 a package. This would provide an estimated $33 million to help balance the state’s ailing budget. Proponents said the cigarette tax would alleviate the need to lower state employee salaries. Proponents also argue that making cigarettes more expensive lowers the number of teenage smokers and eventually saves the state money in Medicaid costs by reducing cancer and other medical conditions associated with smoking. New Mexico currently imposes a 91-cent tax on a pack of cigarettes. With the proposed increase, only 15 states would levy a higher cigarette tax. The proposal is in the House of Representatives, where the Business and Industry Committee voted earlier in the session to effectively kill an earlier proposal to raise the tax on cigarettes. Phelps said the company opposes the tax increase because it would hurt convenience stores and other small business that depend on cigarette sales. The added tax would drive customers to tax-free stores on Indian land, he said. 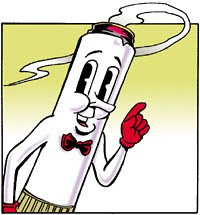 Phelps also noted that the federal government last year increased its excise on cigarettes by $6 a carton. Senate Finance Puts an End to Domestic Partnerships Bill. Everyone knew it would be tough for SB183, which would establish the right to enter into domestic partnerships, in the Senate Finance Committee. The committee finally heard the bill this evening. The panel voted 7-4 to table it. An attempt to send it ti the Senate floor without recommendation failed on 5-6 vote. Voting to table the bill were Sens. John Arthur Smith, Carlos Cisneros, Pete Campos, Sue Wilson-Beffort, Rod Adair, Steve Neville and Carroll Leavell. Voting not to table were Sens. Jerry Ortiz y Pino, Nancy Rodriguez, Howie Morales and Mary Kay Papen. After debating HB118 -- the bill to prohibit campaign contributions from lobbyists and state contractors -- for more than an hour, the bill's sponsor Rep. Joe Campos, D-Santa Rosa asked to "roll over" the bill so than a proposed amendment could be printed and distributed. A few minutes later, the House recessed to go into caucus, assumedly to talk about the budget bill. This has to be considered a blow to the bill's chances of passing. The clock is ticking on the session, which ends noon Thursday. If it does pass tomorrow, it still would have to go through the Senate and its committee process. Before taking a break from the debate, Campos moved an amendment that cut out the prohibition against "bundling" -- people prohibited from contributing collecting contributions from others to give to a candidate. Also he House also amended the bill to allow public utilities to make contributions. Campos said the utilities are regulated by the Public Regulation Commission and don’t compete for contracts. 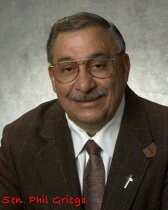 However Rep. Joe Cervantes, D-Las Cruces, pointed out that utilities do contribute to candidates. House Democrats rejected an amendment from Republican Whip Keith Gardner that would have restored a prohibition of people seeking "targeted subsidies" from the state. That provision was cut out sometime during the committee process. UPDATE: Despite the fact the bill won't be voted on until Tuesday, Fred Nathan of Think New Mexico, the think tank that first pushed this bill, said he remains optimistic. In legislative time, Nathan said, there's still plenty of time for the bill to make its way through the Senate. FURTHER UPDATE: 5:49 pm. Rep. Campos confirmed that the bill will be amended again to prohibit public utilities from making contributions and to prohibit all lobbyists and state contractors from contributing to poltiical parties. But the bundling prohibition won't be restored to the bill, he said. It's crunch time in the Legislature. There's a light at the end of the tunnel. Let's hope it's not approaching at a high rate of speech. The first item of interest is HB118, Rep. Joe Campos' bill to prohibit campaign contributions from state contractors and lobbyists. It's number 1 on the House floor agenda. Fred Nathan of Think New Mexico, the think tank that came up with a bill, just got a page to meet with Campos. Ooops. They just passed over HB118. Not sure what's going on at this point. Here's a plug for a new blog by private detective and political operative Mike Corwin. It's called The Everyday Detective and gives tips on how regular folks can gather information. Check it out. 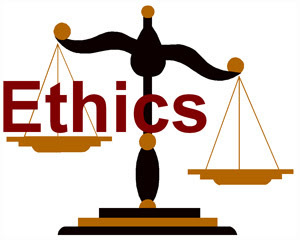 Is Ethics Commission Bill Constitutional? A representative of Governor Bill Richardson said a bill establishing a states ethics commission — unanimously endorsed by the Senate Judiciary Committee on Saturday — contains a section that is unconstitutional. Jim Noel, a state lawyer working for the governor during the session, said Senate Bill 43 would “unconstitutionally silence the voice of complainants.” Under the bill, someone filing a complaint about a state official would have to sign a confidentiality agreement that would not allow him to talk about the case until the ethics commission made a decision. Violating the confidentiality agreement could mean a complainant could face a $25,000 civil fine and a jail sentence of one year. Noel pointed out that this means the complainant could face worse penalties than a corrupt official. Noel is a past executive director of the state Judicial Standards Commission and is married to Richardson's former political director Amanda Cooper. Bill sponsor Sen. Linda Lopez, D-Albuquerque, said the confidentiality agreement does not violate the complainant’s First Amendment rights. “He could hold a press conference right before he files the complaint,” she said. Sen. John Ryan, R-Albuquerque, said he didn’t like a section of the bill that said the ethics commission couldn’t act on any complaint during election season — which is from the primary filing day in March of an election year until the November general election. This might conceal wrongdoing about an elected official or candidate that voters should know before an election, Ryan said. 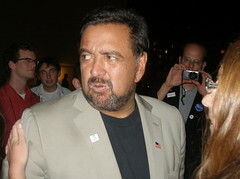 Lopez said the blackout period is necessary to avoid “witch hunts” during an election. Though Ryan voted for the bill, he said he might file an amendment dealing with the “blackout” period. The commission would consist of seven members — two appointed by the governor, four by the Legislature and one appointed by the chief Justice of the Supreme Court. The governor’s appointees would have to be two Democrats and two Republicans — except if the governor belonged to neither major party. The bill goes to the Senate Finance Committee because it calls for a $200,000 appropriation for an executive director and other expenses. Noel said the governor prefers House Bill 125, sponsored by Rep. Brian Egolf. However, that bill has not gotten out of the House Judiciary Committee. UPDATE: Sen. Peter Wirth just notified me that I had the number of commission members in the current version of the bill incorrect in the original version this post. It's been corrected. I can't resist. A bill passed by the Senate yesterday reminds me of a Merle Haggard song. I'm talking about Senate Bill 254, sponsored by Sen. Clint Harden. This would remove the question “Have you ever been convicted of a felony?” from State Personnel Office applications. The bill passed the Senate 35-4 and goes on to the House. I think Merle would agree with Harden. Here's the song. 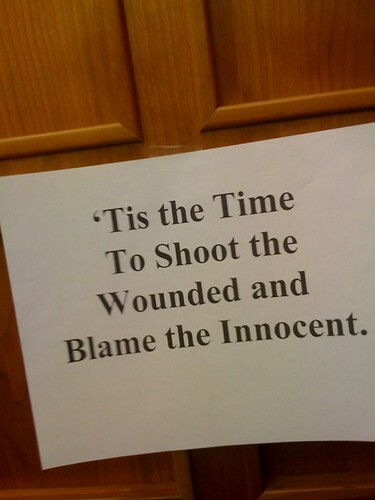 This sign is on a door to the Senate gallery. It's probably left over from the debate Friday on SB 40, which would allow people with concealed-carry licenses to take guns into restaurants that have beer and wine licenses. The bill passed the Senate 27-15 and goes on to the House. "This a crazy bill. 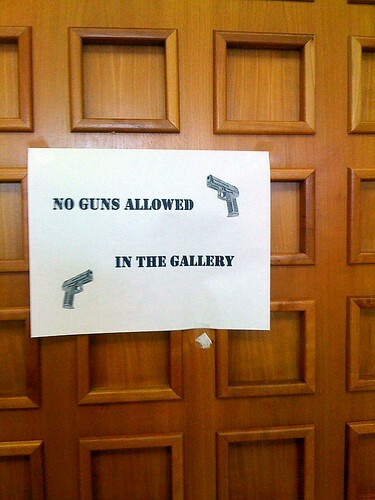 Part of a national campaign by the NRA to broaden the use of concealed weapons." "I believe that if more people carry guns, we will have less crime." — Sen. David Ulibarri, D-Grants, on the Senate floor during the debate of the gun bill. After declaring a weather-related disaster for Northwest New Mexico, Governor Bill Richardson decided another disaster declaration was necessary for the State Capitol Building. WHEREAS, this disaster is of such magnitude as to be beyond the control of the first floor inhabitants and they are in critical need of assistance from the executive branch to avoid further harm to the public welfare. 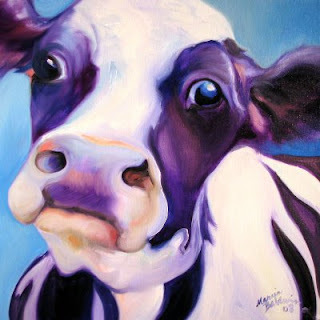 NOW, THEREFORE, I, Bill Richardson, Governor of the State of New Mexico, by virtue of the authority vested in me by the Constitution and Laws of the State of New Mexico, do hereby declare a state of Disaster that results from the excess of bovine manure. I DIRECT the Department of Finance and Administration to make available emergency financial resources in whatever amount necessary in accordance with the laws of humanity and common decency. I FURTHER DIRECT the Department of Homeland Security and Emergency Management to coordinate all requests for assistance and direct all Cabinet Departments and agencies of the State of New Mexico, including elements of the New Mexico National Guard, to converge on the state capitol building with implements and tools necessary to remove the offending bovine manure and ultimately forge a lasting peace agreement that allows a rationale end to the budget stalemate. THIS ORDER supersedes any other previous orders, proclamations, or directives in conflict. This Executive Order shall take effect immediately and shall remain in effect until such time as the Governor rescinds it. A subsequent post explains the emergency declaration was indeed humor. 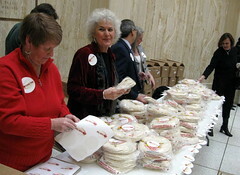 Religious leaders and others who are against the current proposal to tax some food (the current version of Senate Bill 10) just held a rally in the Rotunda to draw attention to the bill and to give away thousands of white flour tortillas -- which would be subject to gross receipts tax under the bill. The New Mexico Conference of Catholic Bishops, St. Joseph Community Health and the New Mexico Conference of Churches put together the rally. The proposal, which is still being considered by the Senate Finance Committee, would reinstate gross receipts taxes on the sale of foods not allowed under the WIC (Women, Infants and Children) supplemental nutrition program. The Rev. Holly Beaumont, legislative advocate for the Conference of Churches, told me that the WIC program provides nutrition classes and free child care for those on the program. "Is the state going to pay for that?" she asked rhetorically. 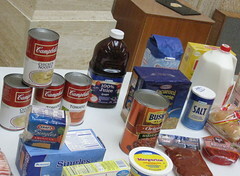 Among the food that would be taxed under the bill is white bread, spaghetti, canned soup, butter, honey, yogurt and nuts. Allen Sanchez, director of the bishops’ organization, said yesterday he was bringing 12,000 tortillas for the event. Many expect the food tax provision to be lifted from the bill before it gets out of the Senate Finance Committee. 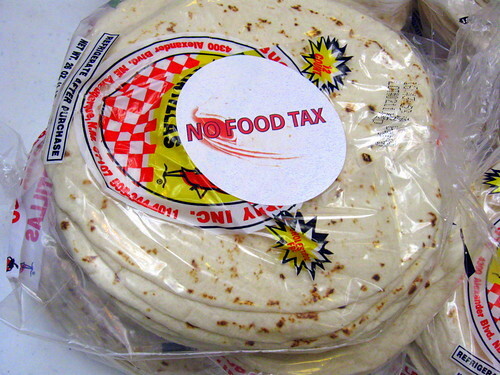 Rep. Gail Chasey, D-Albuquerque said there's no way the House would pass a food tax. She's probably right. Don't count on being able to register to vote at early voting sites this year. Two legislative committees effectively killed bills that would have allowed a voter to register right before casting a ballot at early voting sites or register at the County Clerk's Office when in-person absentee voting is allowed. This morning the House Voters & Election Committee voted 7-5 to table HB 123, sponsored by Rep. Jim Trujillo, D-Santa Fe. That followed the Senate Judiciary Committee's action -- or, rather, inaction -- on SB 161, sponsored by Sen. John Sapien, D-Corrales. There were not enough votes to get a do-pass or a no-recommendation, so that bill's in limbo. Steve Allen of Common Cause, which was backing the bills, said there was a lot of misinformation flying around about them. Opponents claimed that such a law would lead to massive voter fraud and an influx of foreigners voting. Allen said the bill would help young people and those who don't get excited about an election until two weeks before election day. So if you don't get registered before 28 days before an election, you're out of luck. It seemed like a simple enough bill and one that might even get widespread support: Make it easier to get a driver’s license. Cut out the need to spend half your day at the Motor Vehicle Division when your license expires. Senate Bill 137, sponsored by Sen. Phil Griego, D-Ribera, would allow New Mexicans to renew their driver’s licenses online or over the phone. But when it reached the Senate floor Wednesday afternoon and senators started sinking their teeth into it, the bill veered far beyond the MVD. During the next 45 minutes, the discussion touched into areas including illegal immigration, terrorism, drug abuse, Guatemalan gangs and Islam. Not to mention a discussion of racism that began to get heated. In other words, a classic New Mexico state Senate debate. At first, the main discussion of Griego’s bill dealt with technical issues. But things started getting interesting when Sen. Rod Adair, R-Roswell, introduced an amendment that would prohibit the MVD from issuing a license to anyone who wasn’t a citizen of the United States of America. That amendment would have overturned a law the Legislature passed in 2003 that allows foreign nationals to present a passport, a federal tax-identification number or a consular identification card to apply for a driver’s license. Such laws have been a hot-button issue nationwide in recent years. Supporters say it encourages immigrants to get auto insurance and to cooperate with local law enforcement. Opponents say it encourages illegal immigration and could provide terrorists with a way to secure official identification. That’s what Adair argued in introducing his amendment. He said New Mexico’s law flies in the face of the national Real ID Act — which is not yet being enforced. The Real ID Act, passed in 2005 in response to concerns about terrorism, sets strict national standards for state-issued driver’s licenses. Adair said his concerns were based in national security concerns. Without his amendment, he said it would be easier for al-Qaida members to get New Mexico driver’s licenses. Of course, if he could get a license online, at least a terrorist wouldn’t be tempted to blow up the MVD office as he sat waiting there for hours. Several Republican senators angrily said they resented being called racists. He said the United States and Mexico have traditionally had good relationships and noted that those who pulled off the Sept. 11, 2001, terrorist attacks didn’t come from Mexico. Going off on a tangent about drug violence in Mexico, Jennings said this was the fault of America’s appetite for drugs. Some were hoping that Jennings would lead the Senate in another override of some veto by Gov. Bill Richardson — just as a unity-building exercise. Adair’s amendment was defeated by a mostly party-line vote. And when all the dust cleared and all the emotions settled, the Senate passed SB 137 by a 39-2 vote. That was a lot of fire and fury for such a lopsided vote. But that’s our Senate. Gov. Bill Richardson didn't respond to KRQE investigative reporter Larry Barker's report last night about exempt employees. According to the report. Richardson refused to be interviewed and would not allow any of his staff to comment. Instead a spokesman told News 13 the governor feels he's going to be "screwed" on this story and doesn't want anything to do with it. But the Governor's Blog did have this yesterday, perhaps a preemptive move. Some legislators and many news reporters continue to be fascinated with the Governor's exempt employees. Some have criticized the Governor's actions, even though he has been the only elected official to reduce his workforce and cut salaries while legislative employees are not even subject to oversight. With virtually no discussion, the Senate just voted 33-4 to override SB460. This is the one to lessen the governor's influence on the State Investment Council. UPDATE: Senate Majority Leader Michael Sanchez explains he voted against the override because there is current legislation working its way through the Senate. Sen. Tim Keller, who voted in favor of the override, said he wants a bill to reform the SIC that the governor to sign. He noted "There is no override next year" because Richardson will be gone. Looks like override fever is spreading in the Senate. After yesterday's vote to override Gov. Bill Richardson's veto of SB531 from last year's session, the gang of 42 might be considering another override today. This one is Sen. Steve Neville's SB460 from last year. That bill would change the membership makeup of the scandal-plagued State Investment Council, giving the Legislature more influence and the governor less. Neville and Sens. Tim Keller and Cisco McSorley have similar bills this session, all of which have been combined onto a committee substitute SB18. Richardson, despite pocket-vetoing Neville's bill last year, gave a message to allow such a bill to be considered during this budget session of the Legislature. Richardson's spokesman Gilbert Gallegos yesterday dismissed the first override as a "procedural gimmick" and an attempt to "derail the serious business of the legislature." CORRECTED: A previous version of this post didn't include McSorley's as one of the bills that was combined in the substitute bill.